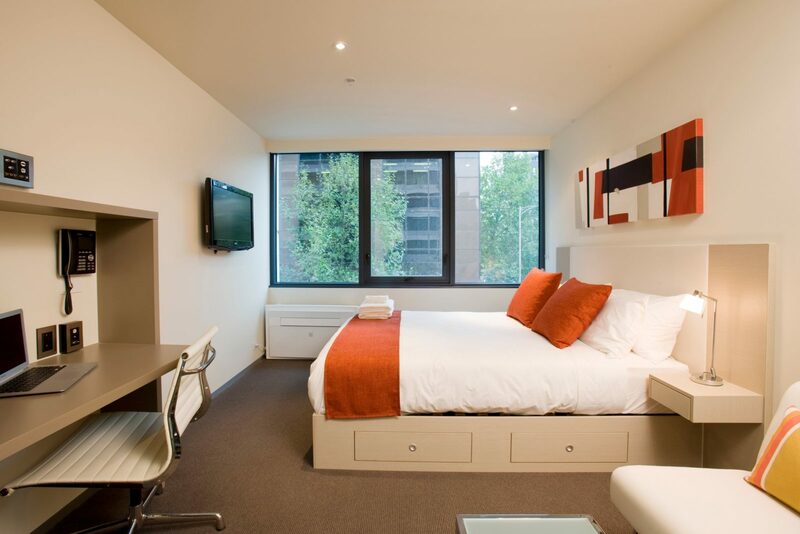 City Tempo’s stylish studio and one bedroom apartments offer all the essentials for a comfortable and enjoyable stay in Melbourne’s exciting CBD. 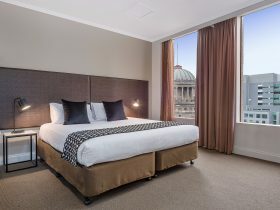 Ideal for both leisure and corporate guests, enjoy easy access to cafes, restaurants, Melbourne Central and only metres to Queen Victoria Market. 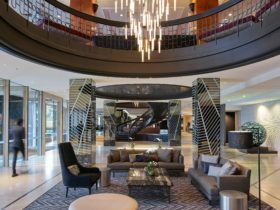 Other landmarks you can walk to include Marvel (Etihad) Stadium, Bourke Street Mall, Emporium, Chinatown and Southern Cross Station. Nearby trams will connect you to Crown, Melbourne Convention Centre, MCG, Melbourne Park, Albert Park and more. 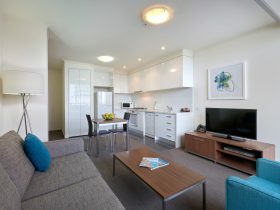 City Tempo’s apartments are stylishly furnished and include kitchenettes, audio/visual appliances and free Wi-Fi. 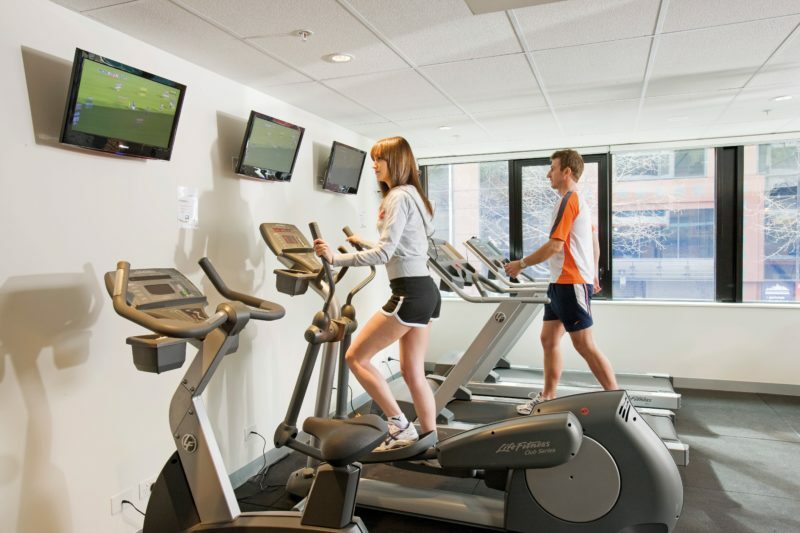 An on-site is a gymnasium and sauna is available. Stylishly furnished with quality fittings and appliances, including heating/air conditioning, combination sheer and block out blinds and low voltage lighting. There is a work desk complete with phone, broadband and AV points. A combined living/sleeping area has a queen bed, two lounge chairs and coffee table. Featuring quality entertainment technology with a 32 inch LCD television. A HiFi system includes DVD/CD player, iPod/iPhone dock, USB media and Digital Radio. Similar to a Studio Apartment, except that these apartments have floor-to-ceiling windows opening to a small balcony. Stylishly furnished with quality fittings and appliances, including heating/air conditioning, combination sheer and block out blinds and low voltage lighting. There is a work desk complete with phone, broadband and AV points. A combined living/sleeping area has a queen bed, two lounge chairs and coffee table. Featuring quality entertainment technology with a 32 inch LCD television. A HiFi system includes DVD/CD player, iPod/iPhone dock, USB media and Digital Radio. The well designed kitchenette with four sets of crockery and glassware incorporates a twin electric cook top, convection/microwave oven, dishwasher drawer and under bench fridge. The shower area is fully tiled with a frosted glass wall. Some Studios have a combo washing machine/dryer subject to availability. 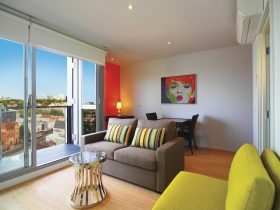 These apartments feature separate living and bedroom areas and are larger than a Studio. One bedroom apartments come in a variety of floorplans and feature a queen size bed, a two and a half seat sofa with a lounge chair, a balcony, combo washing machine/dryer. There is also an additional 32 inch LCD HD television and air-conditioning unit in the bedroom. Stylishly furnished with quality fittings and appliances, including heating/air conditioning, combination sheer and block out blinds and low voltage lighting. There is a work desk complete with phone, broadband and AV points. Boosting quality entertainment technology with a two 32 inch LCD televisions. A HiFi system includes DVD/CD player, iPod/iPhone dock, USB media and Digital Radio. The well designed kitchenette with four sets of crockery and glassware incorporates a twin electric cook top, convection/microwave oven, dishwasher drawer and under bench fridge. The shower area is fully tiled with a frosted glass wall. One bedroom apartments come in a variety of floorplans and feature a queen size bed, a two and a half seat sofa with a lounge chair, combo washing machine/dryer. There is also an additional 32 inch LCD HD television in the bedroom. Stylishly furnished with quality fittings and appliances, including heating/air conditioning (only in lounge area), combination sheer and block out blinds and low voltage lighting. There is a work desk complete with phone, broadband and AV points. Boosting quality entertainment technology with a two 32 inch (81cm) LCD televisions. A HiFi system includes DVD/CD player, iPod/iPhone dock, USB media and Digital Radio. The well designed kitchenette with four sets of crockery and glassware incorporates a twin electric cook top, convection/microwave oven, dishwasher drawer and under bench fridge. The shower area is fully tiled with a frosted glass wall. 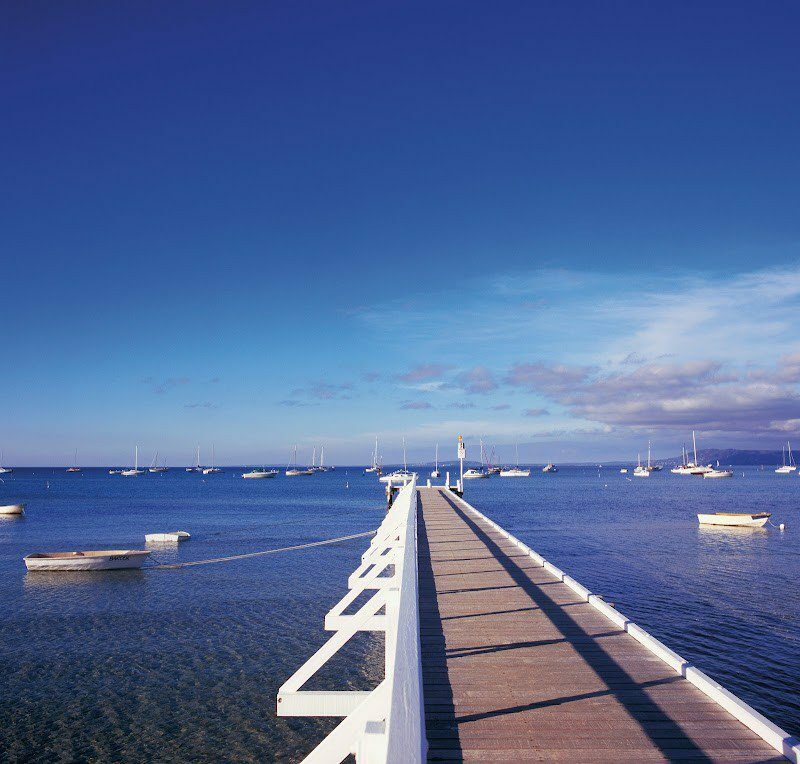 Ideal for a family or two couples travelling together this choice offers two Studio Apartments with a common and secure entry hall. There is a combo washing machine/dryer in one of the apartments. 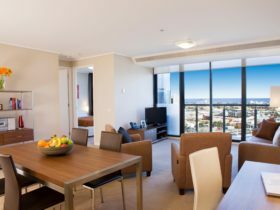 Both studio apartments are stylishly furnished with quality fittings and appliances, including heating/air conditioning, combination sheer and block out blinds and low voltage lighting. There is a work desk complete with phone, broadband and AV points. A combined living/sleeping area has a queen bed, two lounge chairs and coffee table. Featuring quality entertainment technology with a 32 inch LCD television. A HiFi system includes DVD/CD player, iPod/iPhone dock, USB media and Digital Radio. The well designed kitchenette with four sets of crockery and glassware incorporates a twin electric cook top, convection/microwave oven, dishwasher drawer and under bench fridge. The shower area is fully tiled with a frosted glass wall. 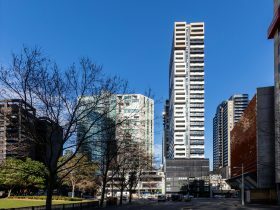 Slightly larger than the Interconnecting Studios, one of these apartments also features a balcony with a city view. 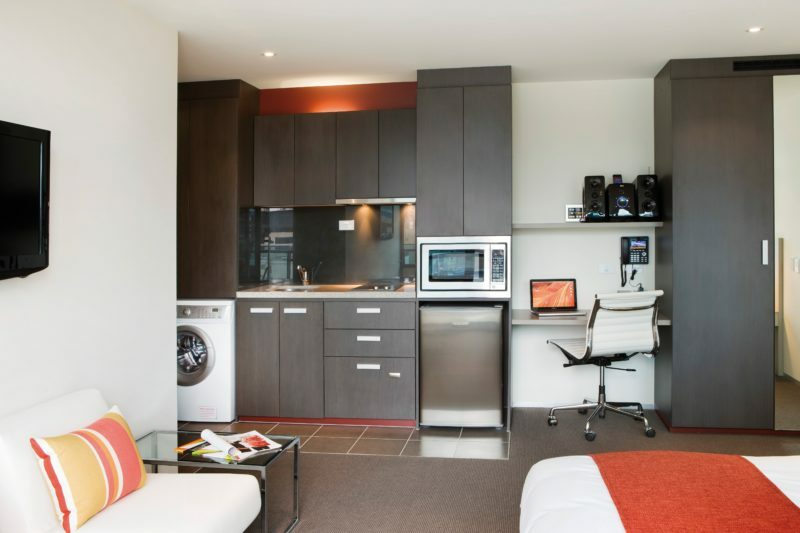 There is a combo washing machine/dryer in each of the two apartments. Both apartments are stylishly furnished with quality fittings and appliances, including heating/air conditioning, combination sheer and block out blinds and low voltage lighting. There is a work desk complete with phone, broadband and AV points. A combined living/sleeping area has a queen bed, two lounge chairs and coffee table.